The majestic fort was built in 15th century A.D. The 5 km long fort on a 125-meter high hill is one of the most impressive and formidable structures. The fort within, have magic of its own palaces such as Mothi-Mahal (Pearl Palace), Fool Mahal (flower palace), Shish Mahal (Mirror Palace) with a rich variety collection of royal grandeur, miniature paintings, folk music instruments, costumes, the furniture and a impressive armoury. This palaces house a fabulous collection of trapping of Indian Royalty including a supper collection of palanquins, elephant howdahs, miniature paintings of various schools, musical instrument, costumes and furnitures. 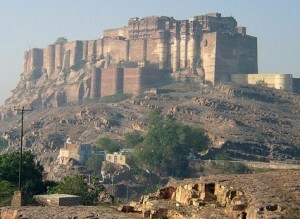 This entry was posted in Mehrangarh, Rajasthan and tagged fort mehrangarh, Mehrangarh, rajastan fort. Bookmark the permalink.